500 posts and a photo journey down the memory lane. 1.My second book hit the Delhi book stores today! 2.This is my 500th post!! Most people who have read my first book (incidentally it is a national best-seller having sold more than 24000 copies and still counting) know how I got here. They know how deeply my dad’s sudden death affected me. I had no one to talk to and even those I considered ‘good friends’ suddenly got busy when they saw a grief stricken shattered side of me, which was rather inconvenient to them. Four years back, if you had told me that I will make a new set of even better friends, I would have been a cynic laughing sceptically at you. Yet, time has proved otherwise. I couldn't help feeling nostalgic today and I went and looked at some old pictures. You can see my daughter in the background. She was just five then. I do not remember where we were driving to. But I remember stopping for the cup of tea. This is one of the few pictures where I am not smiling. 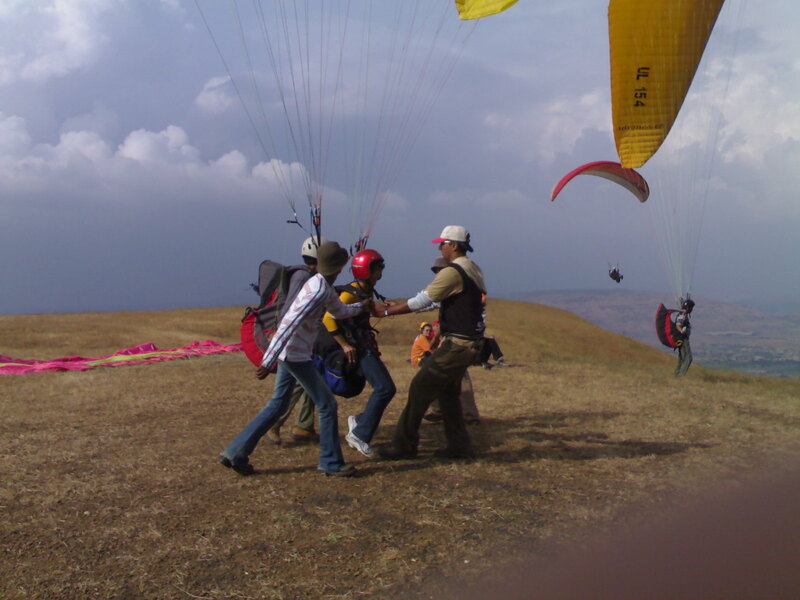 That same year I went paragliding. My dad's sudden death had left me so shaken that I wanted to truly LIVE each day, as I realised for the first time, how truly unpredictable life is. It was a marvellous experience. Yes, it is me in both these pictures. 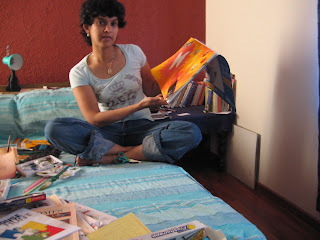 From January 2007 to March 2007, I painted like a maniac. I churned out pictures after pictures. I was at my creative best. They remain to this day, some of my most bizzare, original and creative work. I did not know till that point in time, how much depth really existed in me. 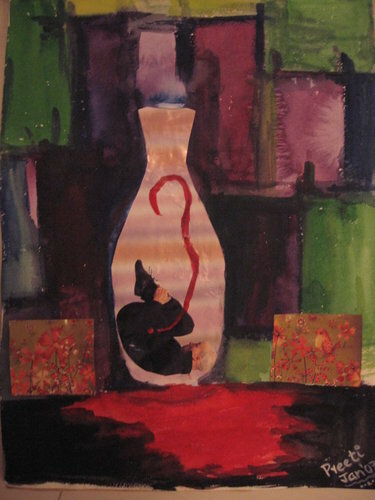 Here is one of my favourite painting from that time. That same month, I won my first International blogging award. I was thrilled to bits. It was the first time, someone was recognising my writing skills and appreciating it. I had never been published before and I remember how much I longed to see my name in print. I got my chance in December 2007. By then, I had won quite a few blogging awards. I approached a local newspaper and offered to write for them. My first assignment was a 500 word piece that I had to write on 'Calendars'. I remember thinking "Oh my God--Five hundred words..How will I ever write?" Today, I can churn out five hundred words in less than 15 minutes. But back then, it looked impossible. I couldn't believe it when my first article was published. ( Yes! That truly was my name in PRINT!) and I was even more elated when I got my first pay cheque from writing. I went on to write for Times of India and Readers Digest. (I must have written more than a 100 articles). Around this time, my poetry (again born out of deep pain) was published in a book by Sulekha series (called 'Sisters in rhyme'). 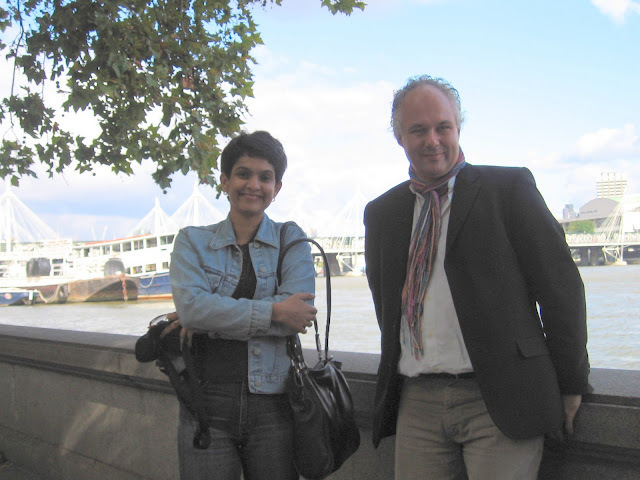 I travelled to UK in September 2007. I had no idea then, that I would actually shift to UK a year later. I met Niall in person for the first time. Till then we had only exchanged mails. 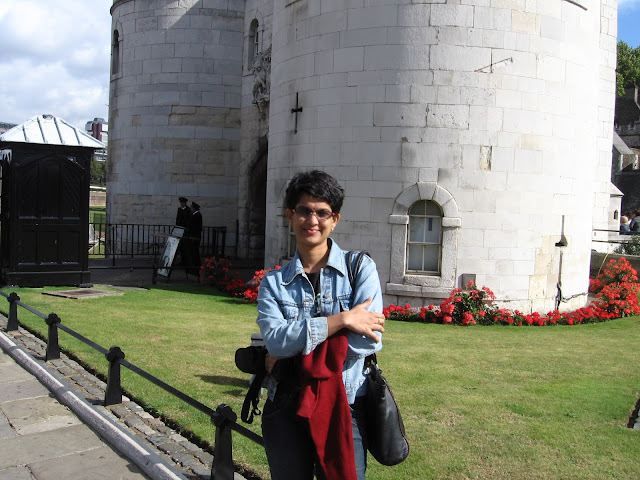 This picture was clicked in front of Tower of London. And this is me, meeting Niall for the first time. 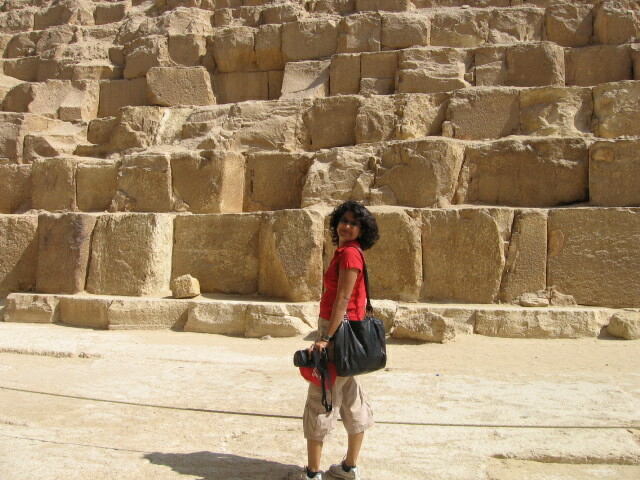 And that was how I looked in November 2007. (And that is my niece). Time flew and I continued writing and painting. This is a picture of me clicked in January 2008, while I was painting a picture. By now my writing had really taken off. Several pieces I wrote were chosen for the 'Chicken soup for the soul' series. I had also written for Delhi Press! Many magazines now carried articles by me. 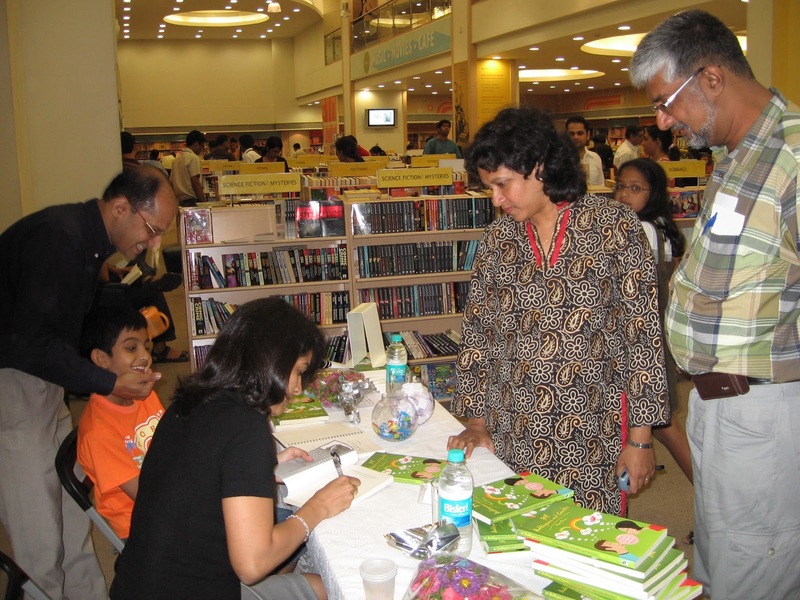 In October 2008, it was indeed a BIG moment in my life, when '34 Bubblegums and Candies' was published. I was fortunate to get some excellent reviews from almost ALL the major newspapers. (click here to read what they said). Suddenly there was the Press calling me up! They wanted to interview me. They clicked my pictures. They wrote down what I said. 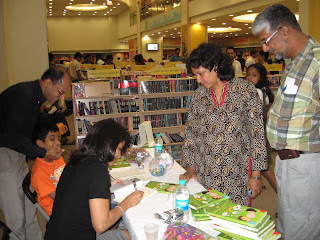 People wanted my autograph on books. Some wanted to click pictures with me! The people in the book stores recognised me when I walked in. I was now a 'celebrity'. As the book began doing well, loads of mails started pouring in. 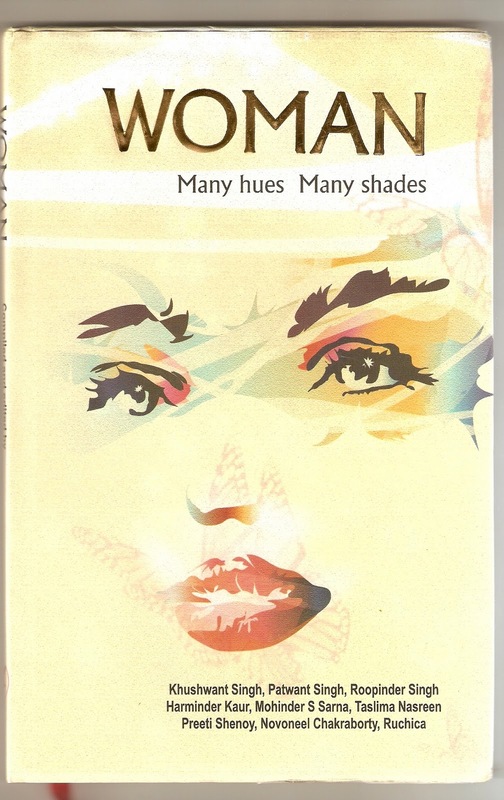 Two pieces I wrote were published in a book called 'Woman--many hues, many shades' and my name appears on the cover with eminent writers like Khushwant Singh and Taslima Nasreen. By now Satish's career had taken a turn too. We moved to the UK. It was an enormous change in our lives. The kids were uprooted from India and thrust into a completely new culture and world. They took to it like ducks to water. 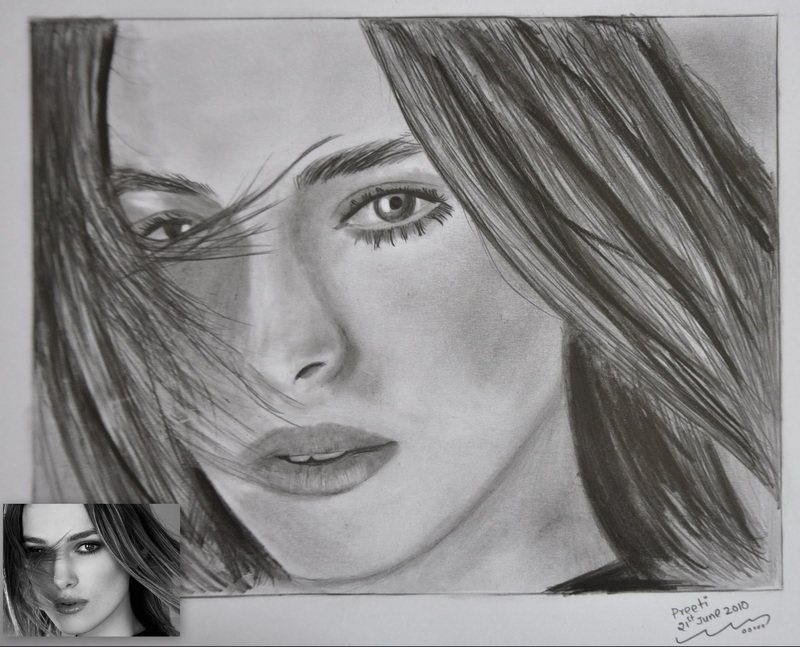 I got an excellent chance to do an internationally recognised degree in portraiture. I enrolled for a course and threw myself into my art. Side by side, I was also working on my second book. Satish was very supportive. He handled everything at home whenever I had an assignment to work on.This is Satish and me--one of my favourite pictures. This was in February 2010 in Cromer, UK. My birthday in 2009 was a truly memorable one. I spent it in India. (I was based in the UK then) with my closest friends. I continued working on my second book and on my portraiture course through out 2010.My first book had started doing really well and I began getting TONNES of fan mail. My portraits began getting more and more realistic. I started accepting commissions! My hard work had really paid off. 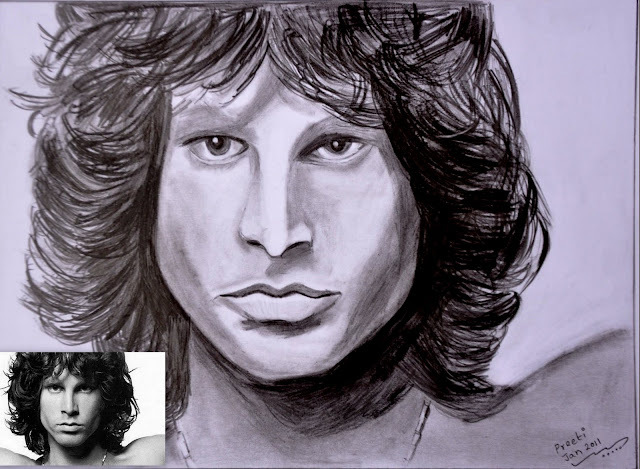 Here are two of my all time favourite portraits(Keira Knightley and Jim Morrison). In October 2010, we relocated back to India. We moved to Bangalore where we are now based. It took us more than two months to find a home, to get our stuff shipped, to find a good school for kids and fully settle down. And today, on the day of my 500th Post (oh, what a long, long journey it has been! ), my publisher called me to tell me that my second book has hit the book stores in Delhi!! Several people who had pre-ordered the book from Flip-Kart called me up to tell me that they had just received it. It was truly a HUGE moment. Today as I sit back, the enormity of my second book coming out, is slowly sinking in. I think back to that day in October 2006, when I so hesitatingly started a blog. I was so scared then of even revealing my identity, online. And to think it all began with one single little blog post. Nice pictures..short hair is cute and long is pretty! Have been following your blog for quite sometime and the one thing that always stands out for me is your cheerful attitude - your ability to appreciate even the littlest of things. I hope you have a book launch in Mumbai. 4. Great Friend - Fantastic spouse 5. Superlative mother of two, and wife of one [;)]. Preeti - am so proud of you. In every step you have supported me and I have over time tried to imbibe some of your great qualities (though may not have succeeded much). My heart fills with joy to see how popular your blog, books and you as a person have become. The world is so much better because of you. So so so happy for you and am so proud of your achievements. Keep it up and soar higher and higher girl. hi preethi!!!!! Even though I rarely comment on your blog posts, i've been always reading them! and this is ur 500th post, omg!!! SO HAPPY FOR U! Your kids and hubby have been a great support all these years! u're very very lucky:)) wishing you good luck for your 1000th post! As you traveled down your memory lane in amazing 500th blog post, I traveled with you as well... Great achievements all in a page of time line. Congratulations on your second book release. Just finished reading the first book review..... can't wait to read the book. All the best for your next achievement. Waiting to see many more posts from you! All the best! Wonderful post - a truly collector's item. What a journey. It may have started in trying circumstances, but I am sure it has been exhilarating since. 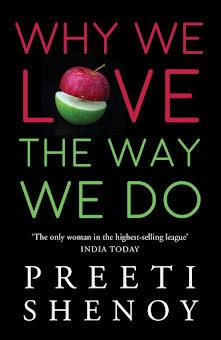 Heart congratulations Preeti. You should be very proud of what you have achieved. Amazing! I feel very inspired whenever I even think about you. I have not met you nor we have spoken over the phone (which I think we should do sometime :)) however I feel blessed to have come across your blog and art. Hard work, dedication and perseverance is a must if you want to fulfill your dreams...and dream we must....each one of us. I am living my dream right now - I am taking all the time off I have to spend with my daughter - the first year of their lives is so fascinating, and they need the most nurturing from their mom. Having worked for 10 years in the corporate world, I feel its a well deserved break as well for me :). Here's wishing you lots of fame n success, as well as peace n joy in your life! I remember clicking on someone's Orkut profile[random,before they started 'lock'ing profiles)) and saw a link to your blog[this was way before I knew what a blog was],once I started reading however,I couldn't stop.I stopped clicking on random peoples profiles and started reading your blog,from the first post till the latest! Though I haven't met you,I feel I know you so well.Loved your first book and am waiting for my copy of your second which would arrive in a day or two through flipkart,can't wait to read it,though I would love to get both the books autographed by you one day!! Congrats a ton for your book and for hitting 500 posts. Can't imagine how long it will take for me to hit 50 :).. And every single one of your posts are a book in themselves.. The short hair suits you the best. You are looking super cute in them :).. And though i din't win your book you bet am gonna buy them and cherish them.. All the best for your future books and keep rocking as always..
Congratulations, Preethi! You truly are an inspiration. Here is to the next 500 posts and hosts of books! congrats preeti,truly a land mark for 500 posts..and these lovely pictures!keep goin..love ya gurl! I have been reading your blog for so long but never commented before (i thought u need a blog to comment). But this is a truly insipirational post. Loved your post and your snaps. Your words have lot of power and that says it all. Eagerly waiting for the book now. And so so nice to read each step of yours that you crossed all these years. You stand as an inspiration to the world now.. Happy that I follow your blog! May the god bless you and all the best in your write ups.. let more books roll in..
Congratssss P! All the best for your second book! and may you realise my dream soon!! (u know wat it is, right? :)] Keep writing!!! I too still remember stumbling upon your blog looong back..n how I got hooked :)Proud of you girl..!! Indeed an amazing journey!! Wishing you many more lovely moments in life!! Extremely thrilled and proud of you, Pritj! It's been one heck of a ride now, hasn't it - not just for you but for all of us loyal readers who have been smitten by your blog. Congrats on this achievement, waiting to follow your many other achievements in times to come, cheers!! P.S: Yet to get my copy of the book. Landlord doesnt get my enthusiasm, so I get a lot of dirty looks every time I enquire about it. Wishing you immense success for your 2nd book and believe me when I say this, I just can't wait to lay on my hands on it! Congratulations! It's great to travel with you through the pics and the moments you have so caringly and openly shared with us. I have admired your writing style and the warm, wonderful human being that you are....don't change being yourself. You are a fantastic person! Your books tell us that ....we look forward to many many more best sellers! First of all Congrats for both your second book and the great milestone of 500th blog post. Haven't read your blog since I was busy these days, will try to read all old blogs once I will get time. An inspiring and beautiful post,preeti!. So many talents and wish you unearth many more. We are waiting to read more and more from you. Beautiful post . First of all , Congratulations on your new book release and 500th post. I have read some amazing reviews about your book already. I am sure this hasn't been easy. When we look at someone's success, we always tend to ignore the hardwork and perseverance. It is one thing to dream big and another to work towards it when the path is not all rosy. Hats off to you. 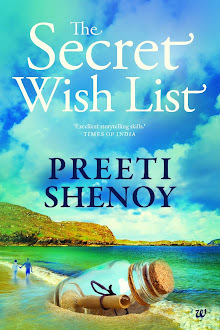 Loads of wishes and luck ..
Congrats Preeti.Am glad your second book is out.Looking forward to reading it. Double congrats, preeti! Wonderful reading through your nostalgic moments...and good pics as always. I am sure ur dad's blessings are in plenty and you'll keep reaching high! Good luck...and heres to many many more! Either way you did it! Keep it up, we'll all read another 500 posts and then some. 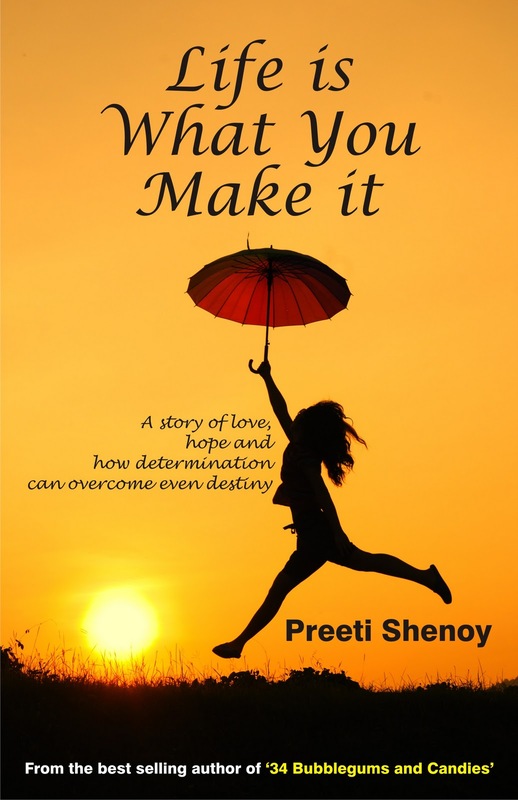 hi Preeti, I got the book and finished it in one sitting... :) The writing is amazing.. I felt as if I was seeting Ankita's life..!! Congrats !!! 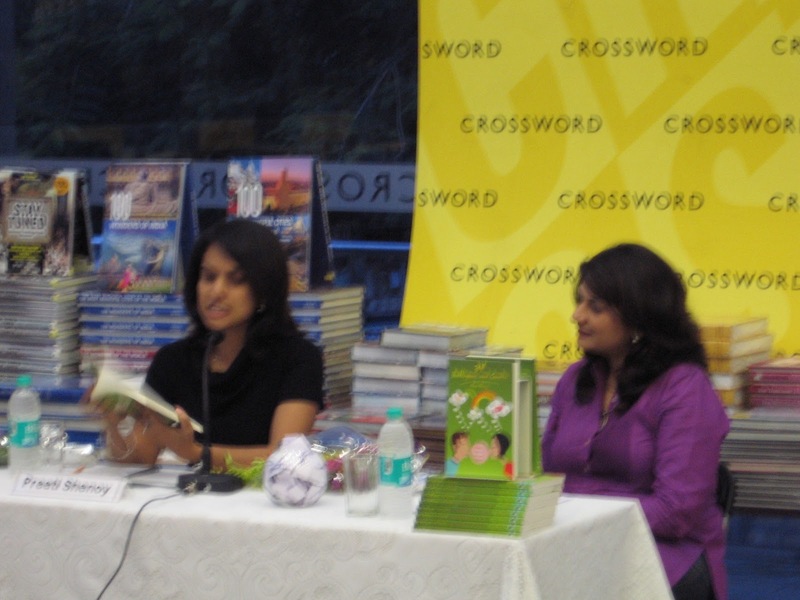 Is your book out here in Bangalore? The heartiest of congratulations! It does not come as a surprise from someone who is SO talented! 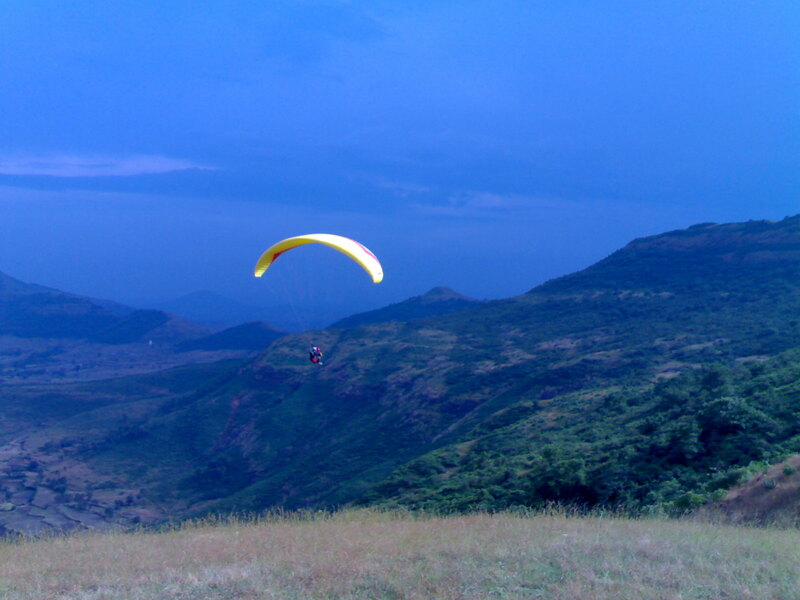 May you scaler greater heights whatever you attempt! Congrats Preeti on your success. Good to see where it all started from. You look so lovely with short hair. Cant wait to read your second one..Is this also available in the US market..
Congratulations to you for both. Happened to come across your blog. Very Nice posts you have posted. I have not gone through all. But whichever i read are very nice. 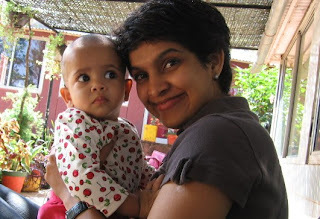 Do drop in to my blog to find some interesting things to know about parenting. Congrats Preeti on your Journey till date... i wish you many more success... and i to wish that a day will come when you would have a Book self dedicated to all your own books and writing. Congrats Preeti and Wish you all the best!!! Loved your old pictures and I guess..you looked like Deepika Padukone in short hair :) I agree with others..Short hair is cute but long hair is beautiful and lovely on you! Loads of luck for your next books. Beautiful post, great photographs. Congratulations and best wishes. and who else would be a better inspiration!!! and gimme ur tips and views!!! Congratulations Preeti !! I am desperately waiting to buy this book in Calcutta - also surely will tell all my friends to buy and read this book. I have read each and every comment--and I truly cherish your words. I was going to reply individually but they would all say just one thing--a thank you from the bottom of my heart. 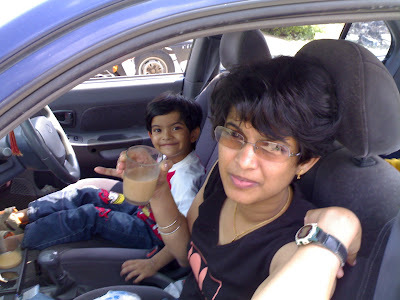 A very special thank you to the love of my life, Satish (who also left a comment! I was so surprised! ), without whom all of this would not have been possible. Thank you to all of you who shower so much love and praise on me! Highly inspiring!! Time is the best medicine all wounds in life. Ur life is no exception to it. U have proved yourself. A beautiful, beautiful post...loved it:-))!!!!! I came across your blog today. Your posts are very positive and inspiring so is your life.